The NASCAR universe is up in arms over the latest fix in Richmond, but what about the poor Fantasy NASCAR players. 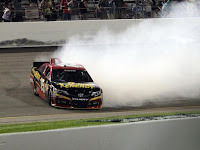 I say this half jokingly, but some Fantasy NASCAR leagues feature cash prizes in the thousands, and Saturday’s Richmond chicanery altered these contests. NASCAR has always been chock-full of conspiracy theories. The loose structure of the sports lends itself to JFK-9/11-Chemtrail type thinking. There aren’t referees dressed in stripes, not one fan has read the rulebook, and millions of dollars is involved. Just as the Earth is the perfect environment for life, NASCAR is an incubator for cheating.